To go straight to the report: DOES REDUCING TRAFFIC SPEED USING SPEED CAMERAS REDUCE THE NUMBER OF COLLISIONS? Speed management is a policy based on the theory that the number of road traffic collisions is directly related to the speed of traffic. It is claimed that the number of collisions can be reduced simply by reducing vehicle speeds, but does the evidence support this claim where slower speeds have been achieved using speed cameras? At all speed camera sites nationally, there were 22% fewer collisions1 in the first three years of speed camera operations (compared to a three year baseline period before), but this reduction included something called RTM (regression to the mean). Figure 7.2. To examine this further we can zoom into the period of two years before and after to include more speed camera sites and show numbers of collisions in even greater detail. Note, there are an additional 30 speed camera sites included in figure 7.2 that could not be included in figure 7.8 as they had not been operating for three years. Official speed camera reports have either ignored the RTM effect or made complicated estimates of its effect therefore, rather than make another estimate, this report takes a new approach of simply excluding RTM. This should obtain the most accurate evaluation of speed cameras to date and the graphs should help illustrate the method. To read the report: DOES REDUCING TRAFFIC SPEED USING SPEED CAMERAS REDUCE THE NUMBER OF COLLISIONS? The report contains a full set of six graphs that show numbers of collisions at fixed and mobile speed cameras separately, as well as compensation for other influences in the Acknowledgements, references and supplementary information page. 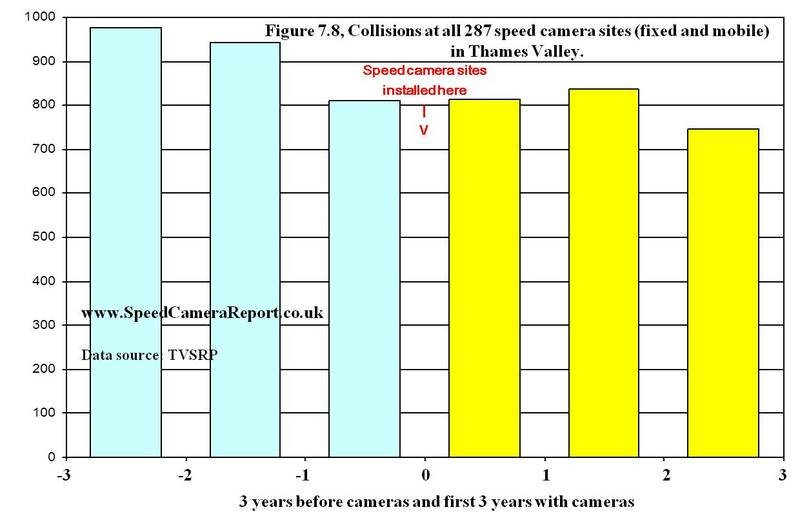 Note 1: The governments national report on speed cameras states that (p4) "Both casualties and deaths were down – after allowing for the long-term trend, but without allowing for selection effects (such as regression-to-mean) there was a 22% reduction in personal injury collisions (PICs) at sites after cameras were introduced." Andrew Forster wrote a very good article for Local Transport Today. He took the trouble to read my report, research other reports and speak to the authors. Speed cameras (and road safety generally) are difficult to evaluate due to the lack of scientific trials, poor standards of test design and difficulty in obtaining data but Mr Forster made a very good job of examining and explaining the evidence available to date. Download the Andrew Forster article published in Local Transport Today. Also, there was a news item on Road Safety GB (with interesting comments) followed by the report being submitted to their scrutiny panel and accepted into the Road Safety GB knowledge Centre. So what is RTM, and how can its effect be excluded? Collisions are essentially random events therefore, on any particular section of road, sometimes there are more of them, sometimes fewer. Speed cameras are often used after a high number of collisions therefore fewer collisions could be expected afterwards, even if no speed cameras had been used. This reduction (that would have occurred anyway) is called RTM (regression to the mean). 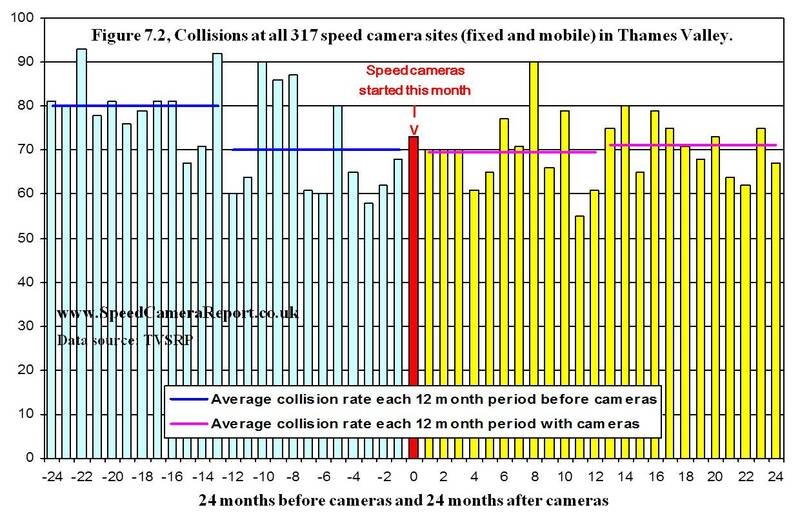 Figure 7.8 shows that there were fewer collisions at sites in Thames Valley after speed cameras were deployed (as was reported nationally), but almost all of this reduction occured a year before the speed cameras started operating. Therefore we know that collisions would reduce without speed cameras because they actually did. So how many collisions would have occurred without the speed cameras? This is easier to establish than might be expected. After the collisions that led to speed cameras being used, it took around a year before speed enforcement started and, during that time, the number of collisions dropped back to normal. Speed cameras cannot go back in time and prevent collisions when they weren't there, so the reduction that occurred a year before they started cannot have been caused by the speed cameras. That reduction, though, does occur at around the time that reductions due to RTM are expected. The collision rate in the year before speed cameras is therefore the rate that should have continued in subsequent years had no speed cameras been used. At all speed camera sites nationally, there were 22% fewer collisions1 in the first three years of speed camera operations (compared to three years before), but this reduction included something called RTM (regression to the mean).